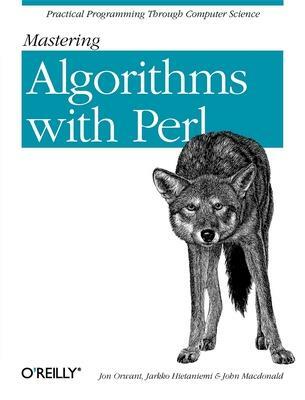 There have been dozens of books on programming algorithms, but never before has there been one that uses Perl. Whether you are an amateur programmer or know a wide range of algorithms in other languages, this book will teach you how to carry out traditional programming tasks in a high-powered, efficient, easy-to-maintain manner with Perl. Topics range in complexity from sorting and searching to statistical algorithms, numerical analysis, and encryption. Jon Orwant is president of Readable Publications, Inc. He founded The Perl Journal in 1995 and served as the sole editor, publisher, accountant, designer, and postal antagonizer until 1999. He has been on the technical committee of all of O'Reilly's Perl conferences (where he is the emcee of the Internet Quiz Show), and he speaks frequently about Perl, most recently at the first YAPC on Rebuilding Post-Apocalyptic Civilization with Perl. He is currently an MIT Media Laboratory IBM Fellow, creating programs that create programs that play games. His other research interests are user modeling and electronic publishing. He gives frequent talks about Media Lab research, most recently on the promise and perils of Internet gambling. In 1993, he created the world's first Internet stock-picking game. His Markov-model based Rock-Paper-Scissors program has been undefeated since 1997. He also performs professional voice-overs. A court injunction from the Commonwealth of Massachusetts prohibits him from cooking or otherwise assisting in the preparation of any foodstuff meant for human consumption. Jarkko Hietaniemi is the creator and Master Librarian of CPAN: Comprehensive Perl Archive Network. He has also been known to frequent Perl developer forums. Luckily enough, getting his MSc in CS in the field of parallel computing didn't interfere overly much with his Perl and UNIX hacking. During those savored moments of off-line time, he fancies gobbling up speculative fiction and popular science. His real life employer is Nokia Research Center. John Macdonald has been using Perl commercially since 1988 for a suite of Unix system administration tools. His background with Unix dates back to the days when Unix was written in PDP-11 assembler and later includes representing the University of Waterloo at the first UNIX Users Meeting at City University of New York in the mid-1970s while finishing his M. Math degree. (In those days before the creation of Usenix, the people at the meeting would sit together around a single table.) In addition, his background includes work on compilers, kernel internals, device drivers and the like. He has also been observed partaking in recreational computing activities.